Beautiful Spring evening blessing local families in Xenia, Ohio. 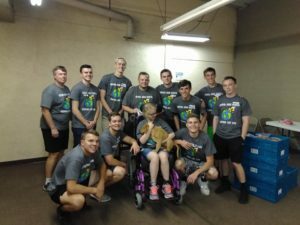 This evening 133 families received 2 packages of dog food for the beloved pets, 3 cooler and dairy items, 6 pack of juices, a bag of potatoes, a bag of onions, 2 heads of cabbage, cucumbers, squash, watermelons, bread, bakery and 14 non-perishable food items. 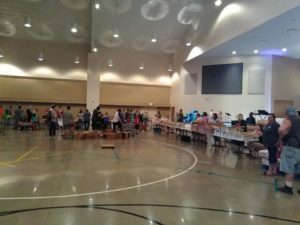 With God’s Grace and Emmanuel Baptist Church provide each person with a meal to eat before they went home. With God’s Grace would like to thank all 34 volunteers for coming out to love on our community and help fight hunger. Love seeing Gods work…This evening the rain held out till all of our families was served. 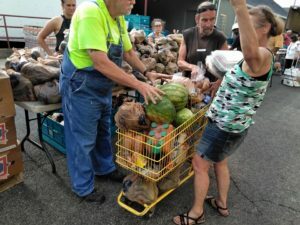 This evening 108 families received 3 cooler and dairy items plus yogurt, watermelons, onions, Potatoes, bakery, bread and 11 non-perishable food items. With God’s Grace would like to thank all the volunteers that came out to help fight hunger. I am the Church “God’s work, Our hands” With God’s Grace is blessed to be at one of our partner Vandalia Nazarene Church. 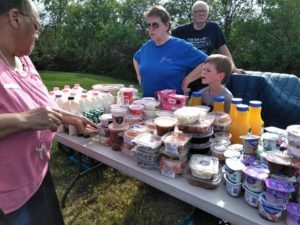 Today we were the hands and feet of Jesus by fighting hunger in Vandalia, Our families were provided with a lunch to eat at the mobile location, the meals included hot dogs fruit cups, protein bars, and bagels, bakery snack and drink. 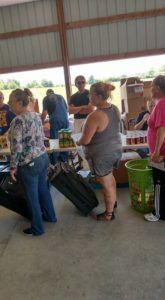 This afternoon 130 families received meats, cooler items, 14 non-perishable food items, bakery, bread, potatoes, and onions. With God’s Grace would like to thank all of our volunteers for coming out today to help fight hunger. With God’s Grace & Vandalia Nazarene Church will be hosting more events in the coming month ahead so, please keep a lookout for more details to come.